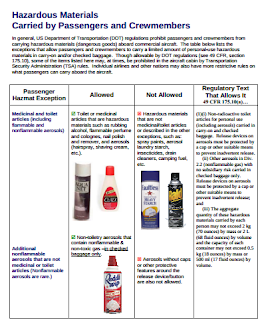 While the TSA has a number of restrictions on hazardous and dangerous items, the FAA allows passengers to travel with several categories of hazardous items on commercial airliners. These exceptions are for small amounts of hazardous materials, typically included in items that are for personal use. Toilet or medicinal articles that are hazardous materials such as rubbing alcohol, flammable perfume and colognes, nail polish and remover, and aerosols (hairspray, shaving cream, etc.). One book of safety matches (book matches) allowed in carry-on bags only. One lighter (gas or absorbed liquid) in carry-on baggage only. Up to 5 liters of alcoholic beverages with an alcohol content of more than 24% but not more than 70% in unopened retail package, in carry-on or checked bags depending on the situation (Note: for tips on how to travel with liquor, which is typically a duty-free item, visit AirSafe.com for advice. A cordless curling iron with a flammable gas cartridge installed. Small personal mercury thermometer in a protective case. Small arms ammunition (up to 19.1 mm for rifle and pistol cartridges, any size bshotgun shells) for personal use, when securely boxed (checked baggage only). Also, check out this 2010 AirSafeNews.com article on how to travel with firearms. One small (4-ounce or less) self-defense spray (checked baggage only). Diving lamps and other battery-operated extreme heat producing equipment, with power disconnected and in carry-on bags only. Small lithium and lithium-ion batteries in consumer electronic devices. Spare batteries must be protected from damage and short circuit and placed in carryon baggage. 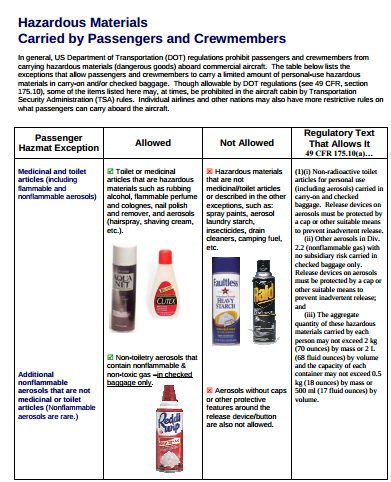 For questions about TSA prohibited items or other air travel security measures please visit tsa.airsafe.com, which has a detailed overview of what is allowed in either carry-on or checked baggage, what is completely prohibited, and what kinds of exceptions are allowed by the TSA. For details on typical airport security procedures please visit security.airsafe.com. You can also visit the TSA web site at www.tsa.gov, or contact the TSA for questions about security procedures or prohibited items at 1.866.289.9673 or tsa-contactcenter@dhs.gov.